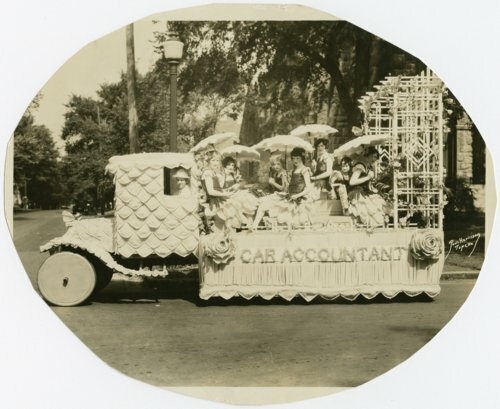 This is a photograph showing women on a parade float titled Car Accountant. The float might be connected with the Atchison, Topeka & Santa Fe Railway. The women in the photograph are: Melvina Cooper, Margaret Dodds, Georgia Stewart, Helen Neiwanger, Mabel Zurick, Ava Woodworth, and Lura McClelland.